There is also a Mongolian immigrant population in Los Angeles, estimated at about 2,000 people as of 2005 [update], according to local community leader Batbold Galsansanjaa . Batbold Galsansanjaa  (1964 - 2012) immigrated in 1999 along with his wife and two kids. In 2000, Galsansanjaa established the first Los Angeles Mongolian Community, a nonprofit organization, and guided over 2,000 first-comers who sought advice; such as from the steps of obtaining Social Security Number, Driver's License, to housing, and etc. The Chicago metropolitan area's Mongolian American community is estimated at between 3,000 and 4,000 people by local leaders; they are geographically dispersed but possess well-organized mutual support networks. Some have established small businesses, while others work in trades and services, including construction, cleaning, housekeeping and food service. In 2004, Lama Tsedendamba Chilkhaasuren, an expatriate from Mongolia, came to the Chicago area for a planned stay of one year in an effort to build a temple for the area's Mongolian Buddhist community. As of 2010, there are nearly 200 people of Mongolian descent living in Skokie, Illinois. The Mongol-American Cultural Association (MACA) was created to preserve and promote Mongol culture in the United States. 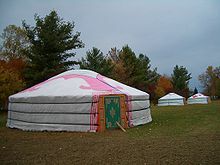 MACA understands the term Mongol to be inclusive of the people and cultures of all regions where Mongol groups have traditionally lived; in addition to Mongolia, it includes the people and cultures of Kalmykia, Buryatia, Tuva and the Mongol regions of China. MACA was founded in 1987 by the late Professor Gombojab Hangin, Indiana University, and Tsorj Lama, former Abbot of the Qorgho Monastery in Western Sunid, Southern Mongolia. Since the death of Professor Hangin in 1989, and of Tsorj Lama in 1991, their students have carried on the work they started. Current board members are Tsagaan Baatar, Chinggeltu Borjiged, Enghe Chimood, Tony Ettinger, Palgi Gyamcho and Sanj Altan. MACA was formally incorporated as a 501C3 non-profit organization in 1992. MACA also pursues a humanitarian program. In 1994, MACA sent $10,000 worth of insulin to Mongolia. MACA was an early supporter of the Peace Corps programs in Mongolia with their English language instructional materials needs. In 1995, MACA established the Mongolian-Children's Aid and Development Fund (MCADF) which functioned as the fund raising and executive arm of the various humanitarian initiatives aimed at providing aid to Mongolian children. Former Secretary of State James A. Baker III serves as honorary chairman of the advisory board to the MCADF. The MCADF has provided nutritional aid and clothing to orphanages and provided small stipends to selected orphans. From 2004–08, the MCADF sponsored the Night Clinic operated by the Christina Noble Foundation, which provides medical services to the street children of Ulaanbaatar. MACA is a primary sponsor of the Injannashi Fund, which provides small educational grants to students in Southern Mongolia. MACA also provides small grants from time to time to cultural and educational institutions to support cultural events related to the Mongolias. In 2011, the MCADF provided a grant to assist the Wildlife Conservation Fund with its 'Trunk' program in Mongolia, which aims to educate school age children on the importance of wildlife and environment. MACA holds a Chinggis Qan ceremony annually, a continuation of the Chinggis Qan memorial held in the Ezen Qoroo region of Ordos. This ritual was started in the United States by teachers Gombojab Hangin and C'orj'i Lama in 1988, and is held annually in late fall. In 1999, to mark the 10th anniversary of the death of Professor Gombojab Hangin, a Chinggis Qan Symposium was held in his memory, which resulted in the publication of the proceedings with articles from scholars from Mongolia, Southern Mongolia, Buryatia and Kalmykia. In 2012 MACA celebrates 25 years of the ceremony in the United States. MACA is open to all individuals who share a common belief in the importance of preserving Mongol culture in the United States. ^ a b c "Profile of General Populationa and Housing Characteristics: 2010 Census Summary File 2, Mongolian alone or in any combination (465) & (100-299) or (300, A01-Z99) or (400-999)". American FactFinder. United States Census Bureau. Retrieved 8 October 2012. ^ RT UK (7 August 2015). "Steven Seagal: "I'm a Russian Mongol"". Retrieved 18 April 2018 – via YouTube. ^ "«Таких храмов, как этот, я не видел никогда в своей жизни» » Сохраним Тибет! - Тибет, Далай-лама, буддизм". savetibet.ru. Retrieved 18 April 2018. ^ Aghajanian, Liana. "Will Mongolia's Boom Cost Los Angeles Its Growing Immigrant Community?". The Atlantic Cities. The Atlantic Cities. Retrieved 23 August 2012. ^ Kang, K. Connie (2005-11-26). "L.A.'s Christian Mongolians Find Home at Church". Los Angeles Times. ISSN 0458-3035. Retrieved 2017-10-27. ^ "Los Angeles Mongolian Cyber Community - Next Step Шинэ Жилийн Цэнгүүн - IMG_1070". www.lamongols.com. Retrieved 2017-10-27. Lee, Jonathan H. X.; Nadeau, Kathleen M. (2011). "Mongolian Americans". Encyclopedia of Asian American Folklore and Folklife. 1. ABC-CLIO. pp. 811–850. ISBN 9780313350665.